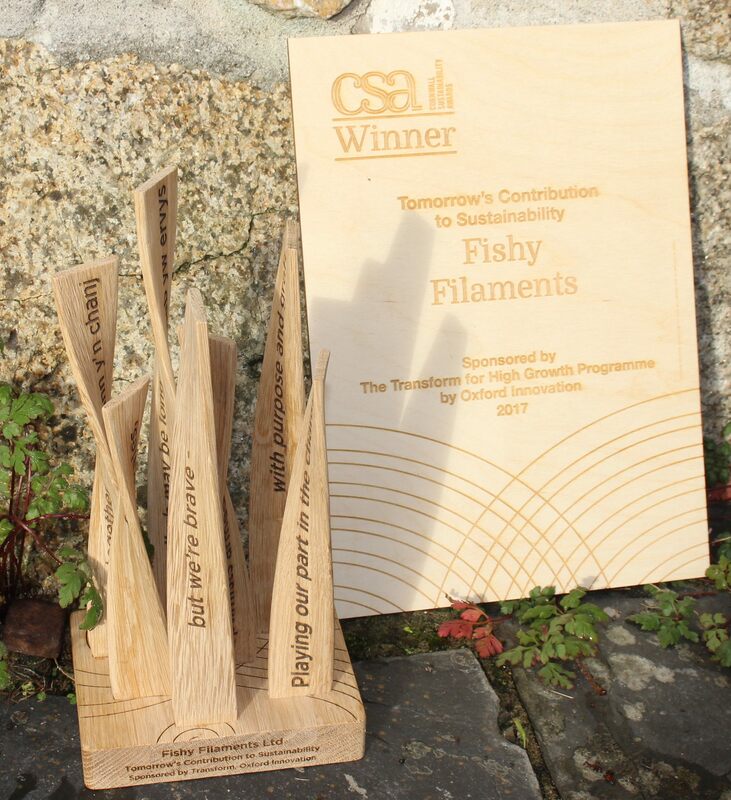 Last night Fishy Filaments won the in the category ‘Tomorrow’s Contribution to Sustainability – The Greatest Potential Contribution to our Tomorrow’, otherwise known as Best Innovator, sponsored by Transform for High Growth/Oxford Innovation. Judges from the Cornwall Chamber of Commerce, Environment Agency, Cornwall & Isels of Scilly Local Enterprise Partnership, Cornwall Local Nature Partnership, Cornwall & Isles od Scily Growth Hub and two independent consultants unanimously chose Fishy Filaments as the best innovation from this year’s field. Many thanks to the judges and the other finalists in all categories. Cornish ingenuity, imagination and engineering were all on show last night and rightly celebrated. The award was designed and made by Tom Raffield, ecotrophies.net and leap.eco with a poem in Cornish & English by Beth Breedon.